In just 2 weeks Moon City will open up at PURE Theatre as part of the Piccolo Spoleto Festival in Charleston, South Carolina. The newest iteration of the spectacle brings a whole new set, brand new puppets, and more paper cuts than ever before. Here's Al Bennet, an alligator with one healthy pair of champers and an appetite for dreams. One of these days I'll get alligator head puppets out of my system, but that purge doesn't seem to be coming anytime soon. We're throwing open the gates to Moon City for three performances at Piccolo Spoleto in Charleston, SC. Come see us May 29th at 8pm, May 30th at 2pm, or May 31st at 7 pm. Each performance will be at PURE Theatre (477 King Street). Tickets are $15 and can be purchased here. This is just one of the sculptures I made for Miniature Curiosa's Toy Theater Parlor. These will be on display until April 18th. An Excruciatingly Ordinary Toy Theater Show has four weekends left. Get your tickets here. George Washington: Toddler. Because even presidents wore diapers. Visitors will find an unusual something tucked inside the bright blue warehouse of 1906 S. Flores starting May 20th. Zach and I have been converting our studio into a Toy Theater Parlor where we will serve up popcorn, paletas, and puppets from March 20th to April 18th. 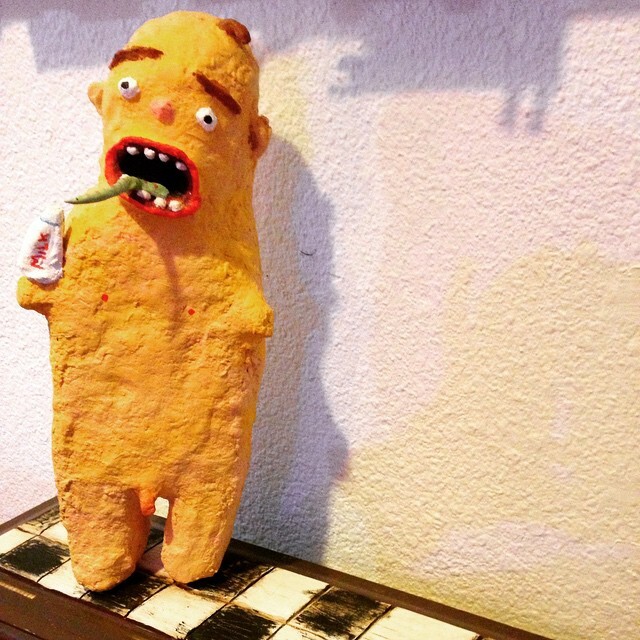 Zach's new solo show An Excrutiatingly Ordinary Toy Theater Show will make its San Antonio debut inside the space. My clay sculptures will also be cozied up along the walls. Here's an article about the space.